We now have Party Forks on offer. These are good quality 18/10 Stainless Steel products but not made in Sheffield. Some people call them "Sporks", "Splaydes"," Splades", some say "Buffet Forks". Our official term for them is "Party Forks". We think that they are the best item on the market in this style of product. Party Forks are a much sought-after kitchen utensil and they also make great gifts. Party forks are combined knives, forks and spoons, all in one single piece as per the illustrations. 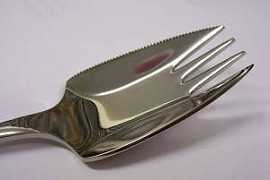 One edge of the party fork can be used as a cutting edge and the surface of the fork area is concave or spoon-like. The items have 4 prongs. In addition to an overall spoon shape with four fork tines, it has two hard, flat edges on either side, suitable for cutting through soft food. They have a geometric rather than rounded bowl, with two folds in the metal. Persons who have physical difficulties in holding two items of cutlery may find that these party forks are a great help. Sooner or later, most of us will have a use for these party forks. We all like to entertain, but not always to a sit-down meal. These items of cutlery will always come in handy. 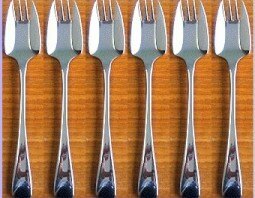 They are used by fast food restaurants, schools, prisons, in the military, by backpackers while camping and for airline meals as they are a lightweight and space-saving alternative to carrying both a knife, fork and spoon. The party fork is perfect for your backpack, boat, picnic basket, lunchbox, purse or briefcase. 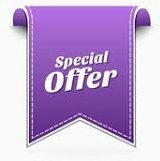 They make the perfect gift for special occasions, Christmas, wedding presents, or to say thank you for a party invitation. Ask yourself - Who wouldn't want a set? If you need multiple sets or larger numbers, please see our Trade Enquiries page for details. Enquiries are welcome from caterers, hotels, event organisers, retailers, etc. We can also provide Engraving if required. Buy them loose in pairs, sixes, batches of twenty or in other quantities. 18/10 Stainless Steel Set Of 2 Party Forks. 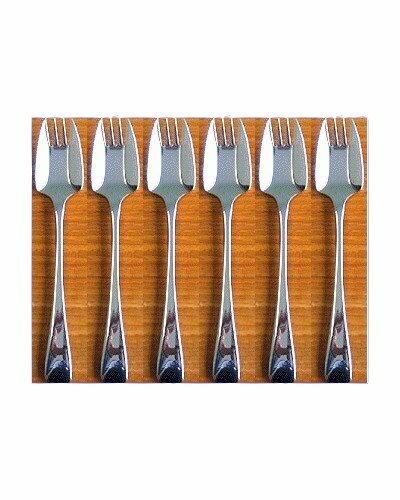 18/10 Stainless Steel Set Of 6 Party Forks. 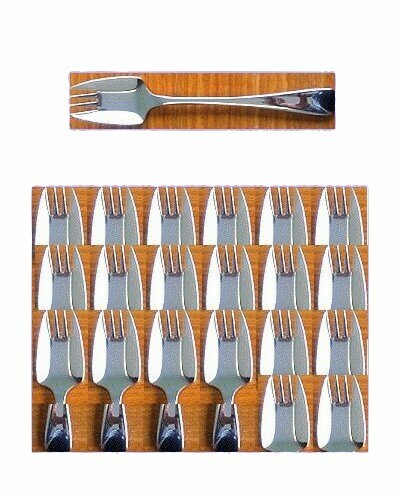 18/10 Stainless Steel Set Of 20 Party Forks. Many thanks for sending over the sample party fork. Its great! We need 250 of them so I am hoping you could do me a great deal as it is such a large order? Arrived and they're brilliant. I'm a typical ex-squaddie. Used the spoon last night for steak and chips - worked perfectly. Order has arrived safely. They look 'absolutely stunning'. May need to re-order. Thanks very much. We received them today and I'm really pleased with them. 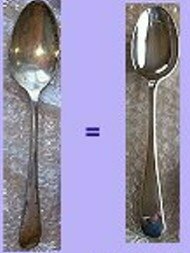 Since it is so extremely difficult to find the "PERFECT" spork I am delighted to have found yours! They are DEFINITELY the BEST on the market! Will SO ENJOY using them on a daily basis! Thank you. I received my party forks yesterday. Work finally let me off soon enough to go by the post office to pick up my parcel. The party forks look great and feel strong. It was great doing business with you. You will be the first place I go to for future party fork orders.